I’m so excited to finally try making Homemade Vanilla Extract myself. 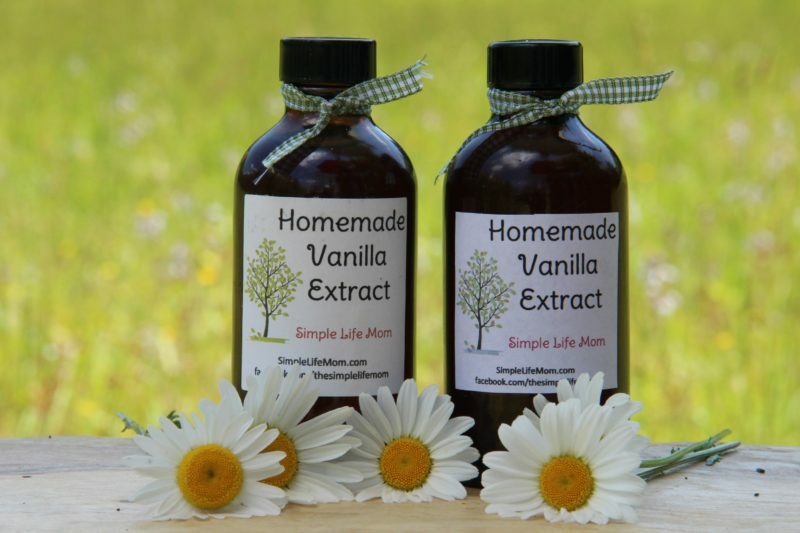 Someone gave me some homemade vanilla extract last year for Christmas. I loved it so much, and I can never pass up an opportunity to make something for myself if it’s not too complicated. So at the beginning of this month I went to the liquor store and bought a gallon of vodka. 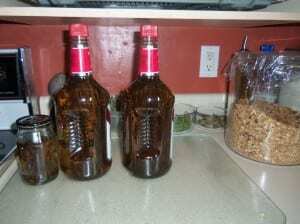 You can buy the cheapest kind of vodka that they make and it will make excellent homemade vanilla extract. But, I would rather have vodka that was made from non-gmo corn, so I either look for organic vodka (expensive) or buy vodka that was made in a country with no gmos – like Finland (almost the same price). I purchased some Madagascar vanilla beans from Amazon (you can find some here), and was ready to go. Pour a little vodka out of each bottle into a small jar so that you have room for the vanilla beans. I bought two 1.75 liter bottles, and used an empty peanut butter jar for the extra vodka. Cut the vanilla beans in half with scissors. You can leave them in tact so that the bean is joined at the top, or cut them fully in half. Place 40 beans (80 halves) in each bottle. I bought a few extra and put 8 in my small jar as well. Seal and store 4 - 6 months in a dark place. Take out and shake occasionally. And when you are done, you will have an amazing dark and delicious extract that is far better than any store bought vanilla extract. I now ONLY make my own because it is that different. Or, if you don’t want to make your own, you can always buy some of mine in my SHOP. Linked to some of these blogs. What is your vanilla bean of choice? Love the can-do attitude! I have never tried making my own extract before but when I received some extract from Mexico and it tasted so much better than ours here in the states I decided it was about time to make some. Your recipe looks so delicious it makes me want to start making it right away. 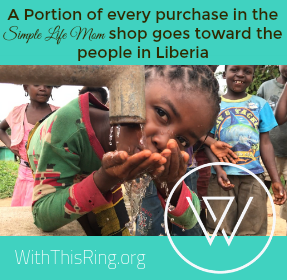 Thanks for sharing on Create Link Inspire. I have been wanting to try making vanilla extract. Thanks so much for sharing with the Let’s Get Real party. I love this! Super easy – so I’m pinning this to our Mostly Homemade Mondays group board! 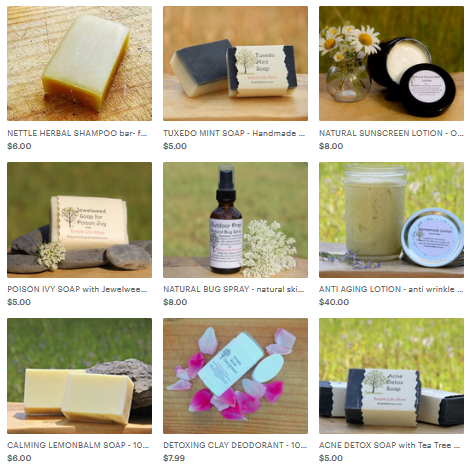 Thanks for sharing on Mostly Homemade Mondays. I can’t wait to see what you link up tomorrow! 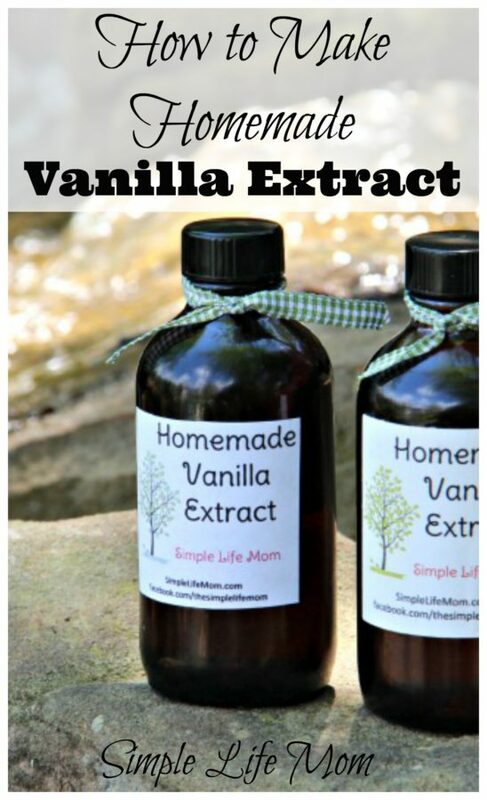 This is a great recipe, I just love Homemade Vanilla Extract. Hope you have a great weekend and thank you so much for sharing with Full Plate Thursday! Can you tell me where you buy your vanilla beans? Where do you get your containers from? http://www.abundanthealth4u.com. Either that or Amazon is where I usually find the best deals.